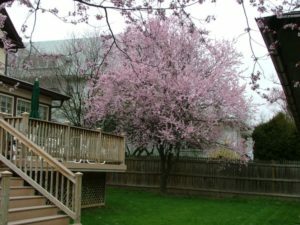 Shown here are a sample of some of the best flowering and top performing trees we use with photos and short descriptions. 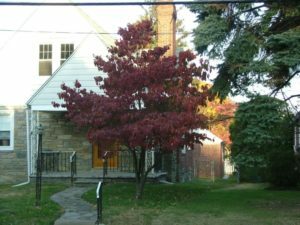 We use many other trees not shown here, and if you have a favorite tree it can be used in our designs. Click on a photo for more information and a larger photo. 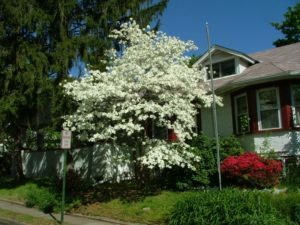 *The photos below were taken at various locations in the area as good examples of flowering trees and do not necessarily have any connection to Robert J. Kleinberg Landscape Design and Construction. 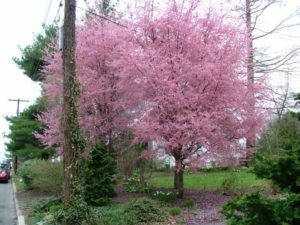 Cherry ‘Okame’ – Blooms late March/ Early April before the leaves, one of the first trees to bloom in Spring. 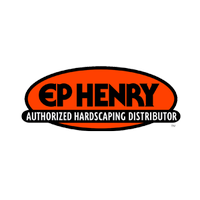 Grows fast to 20- 30-ft. with a spread almost as wide. Nice green in Summer and good fall color. 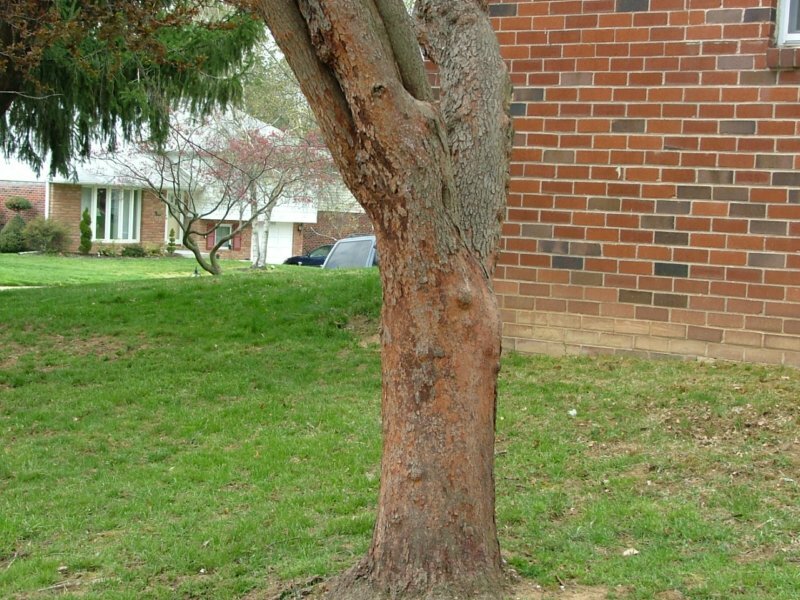 Nice ‘Cherry tree’ bark. 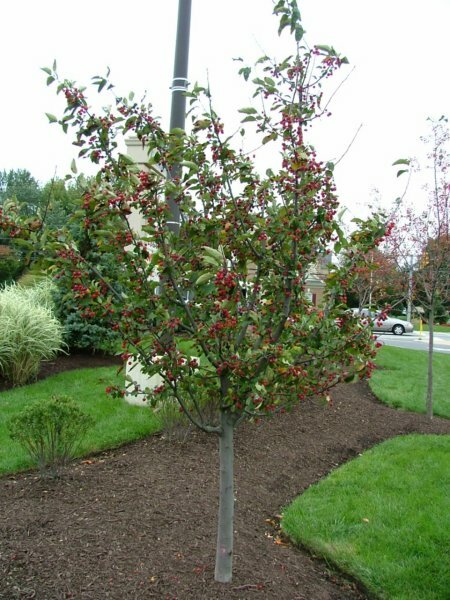 Crabapple – There are a lot of varieties of crabapple with a lot of different habits. Blooms come in white, pink, and red in mid to late April with the emerging leaves and last about a week. (a little shorter bloom period than cherries). 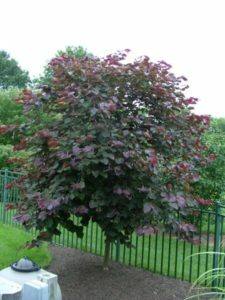 Newer varieties are more disease resistant and have much nicer leaves in summer and fall. Varieties with smaller fruit usually are neater in fall because birds eat the fruit. The fruit can be very showy in the fall and into the winter. 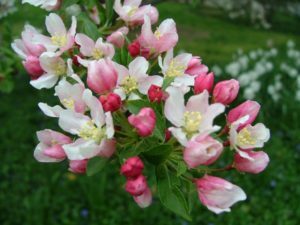 More on Crabapples at bottom of page. ‘Prairifire’ – grows to 20-ft. and is very disease resistant. 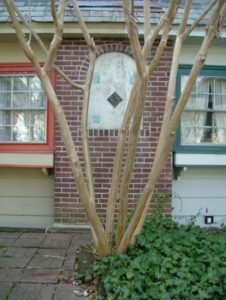 Crape Myrtle – Blooms for a long period in Summer when not much else is in bloom. Flowers come in White, pink, purple and red. Flower in summer when most other trees are just green. 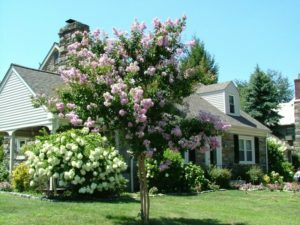 Very colorful plants with the ends of the branches holding large bunches of flowers that come in pink, red, purple, and white. 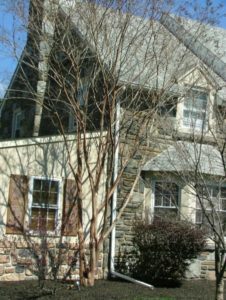 The habit of the plants can vary from narrow small trees to wide shrubs with multiple stems. There are also dwarf shrubs available. Newer varieties are much better suited to our winters. Older varieties would sometimes die back from very cold temperatures. Great bark in winter and nice foliage in summer. 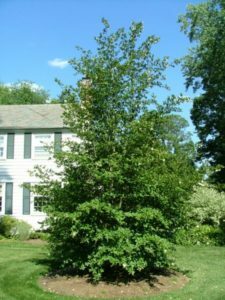 Habit varies, it is sometimes grown as a bushy shrub or a small multi-trunked tree. 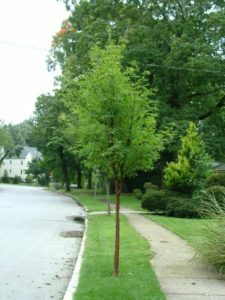 Generally gets as wide as tall but some trees have a narrower habit. Grows 15 to 25-ft. tall in our area. 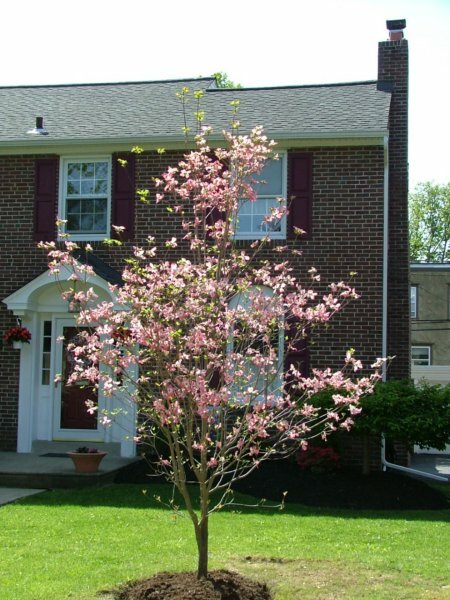 Dogwood – Dogwood grow 20 to 30-ft. Has horizontal branches so usually has a spread wider than the height. Would need pruning in a narrow area. 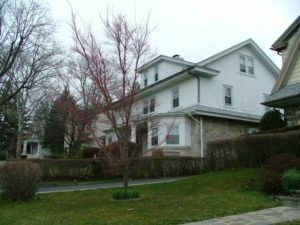 Covered with flowers for about two weeks in early May. Flowers color ranges from white to various shades of pink to red. Nice red berries in early fall and great red fall leaf color. 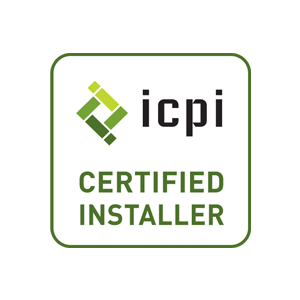 Has problems with diseases and insects so can be short lived. 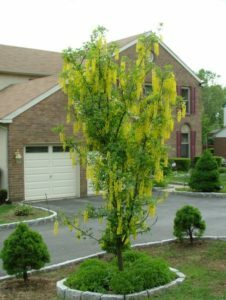 Golden Chain Tree – Grows about 10 to 15-ft. tall with hanging golden flowers in mid-May. Very showy in bloom. Green bark on younger trees. Nice green leaf color in summer. Can be short lived. Japanese Maple Sango Kaku – A variety of Japanese Maple with interesting red bark in winter and Green leaves in summer. 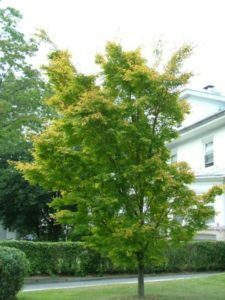 Grows 20 to 25-ft. high and seems to have a little narrower habit than other upright Japanese Maples. 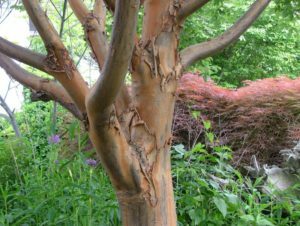 Paperbark Maple – Great peeling brown bark, nice green leaves in Summer, and good red fall color. 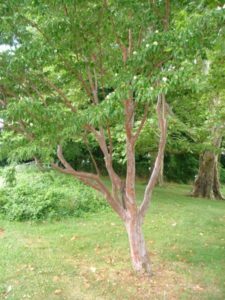 Grows 20 to 30-ft. Great small tree. 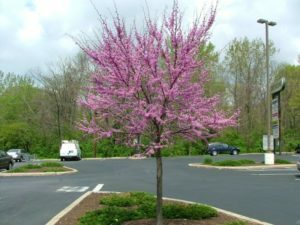 Redbud – Blooms in Late April/Early May for a couple of weeks before the leaves come out. 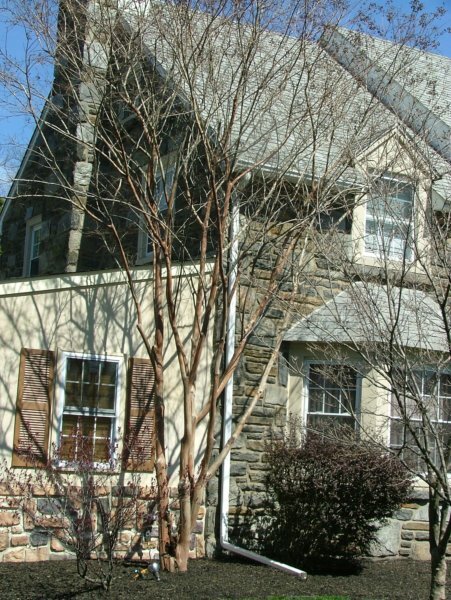 Flowers are tight to the branches, forming buds right on the bark. 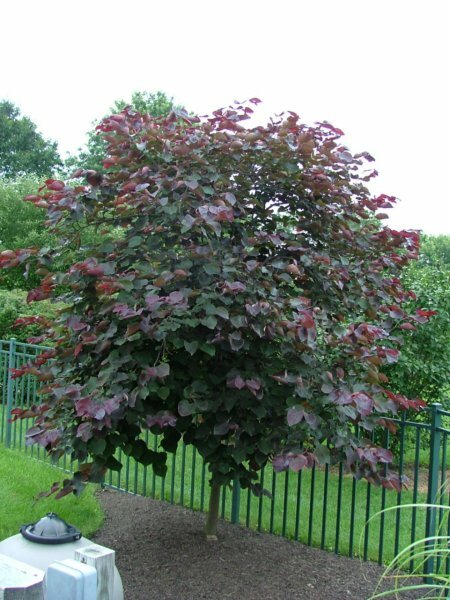 Leaves often reddish when they first come out, and good green in summer. 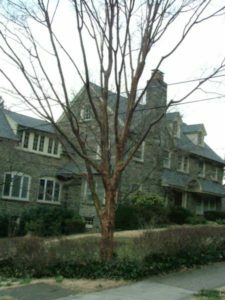 Orangish bark can be a little interesting in winter on older trees. 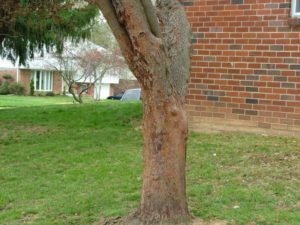 Trees get 20 to 30-ft. high and can get as wide but some trees seem to have a tighter habit than others. Forest Pansy is a nice purple leaf variety with the purple color fading somewhat through the summer. Fruit is a dark pod and sometimes can make a tree look a little ratty if it has a lot of pods. 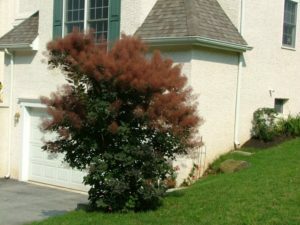 Smoketree – Purple and green leaf varieties. Grows 10 to 15-ft. high and wide. 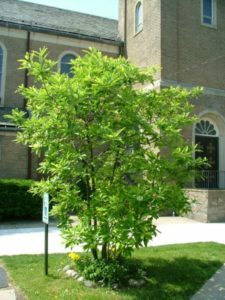 Habit can be irregular and vary from tree to tree. Flowers are not showy but hairs then grow in bunches to give the smokey effect in Mid-June and July. 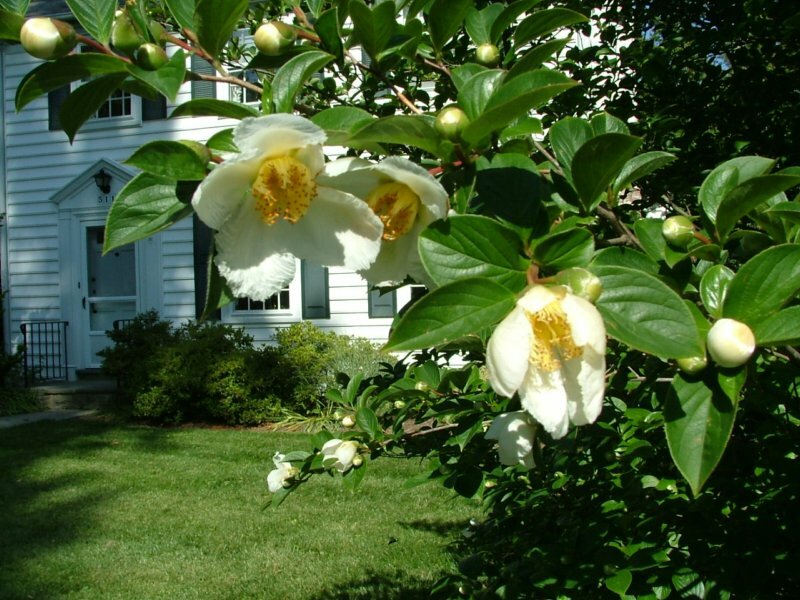 Stewartia – Blooms in June after Spring flowering trees. Flowers open over a couple of weeks but only last for about a day so you never get a tree covered in flowers. Great bark in winter. Bark peals to expose different colors underneath. Good leaves in summer and good red fall color. Grows 20 to 30-ft. tall. 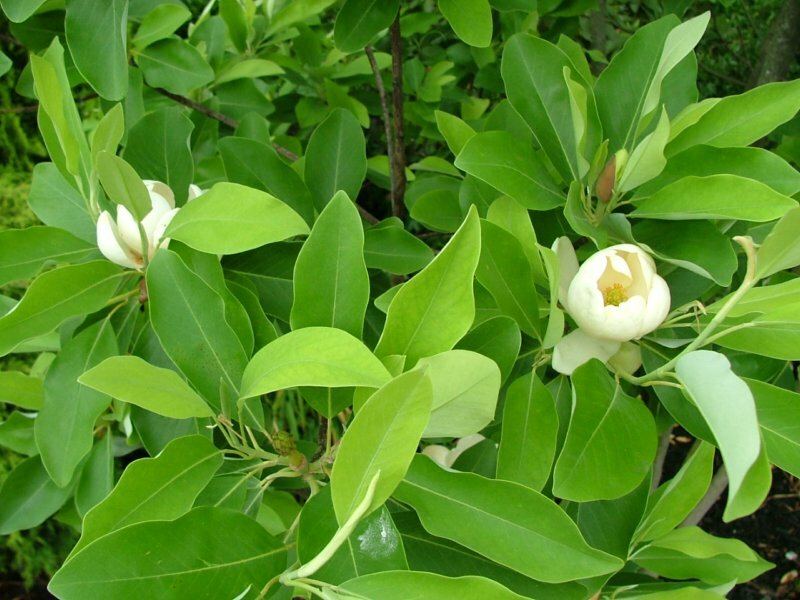 Sweetbay Magnolia -Blooms in June over a few weeks with a few flowers at a time – not usually a really big flower show, but flower have a very nice lemony fragrance. 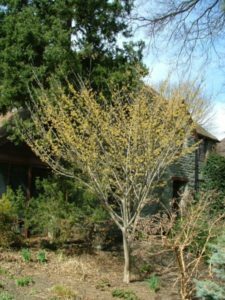 Some varieties keep most of their leaves in the winter. 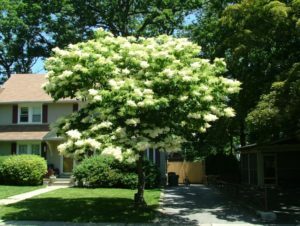 Grows to about 20-ft.
Tree Lilac – Large white flowers for about two weeks in early June. Nice green leaves in summer but not much fall color. 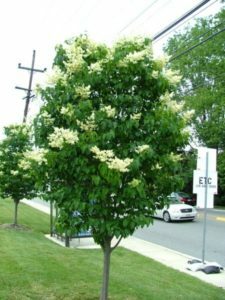 Grows 20 to 30-ft. high and some trees grow wider than others. 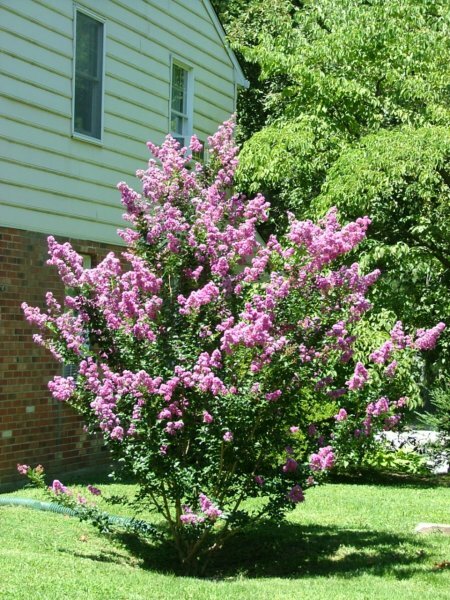 Fragrance in not as nice as old fashion lilac shrubs (described as privet like). 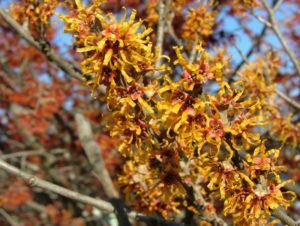 Witch Hazel – Often grown as a shrub. 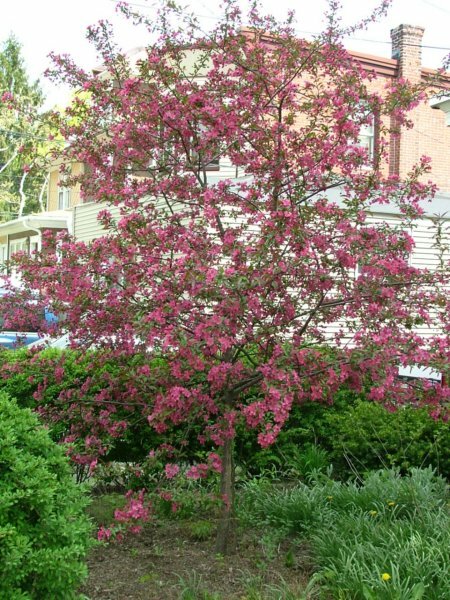 Can be pruned to a tree form and grows to about 15-ft. Can be wide spreading if not pruned. Blooms in late winter when little else is blooming. Blooms can be yellow, orange or red. Not typical shaped flowers with tough strap like petals. Nice green leaves and some types have good fall color. 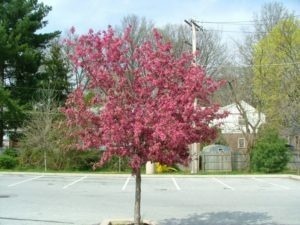 Crabapples (Malus) – bloom in early spring about the same time as dogwood trees. Most commonly used varieties have small berries (apples) that can persist into winter for added interest. 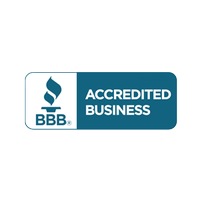 The berries are usually small enough to be eaten by birds and are usually not a problem with fruit dropping on lawns. Older varieties had problems with various leaf diseases and often dropped their leaves before the end of the summer. The leaves of newer varieties are resistant to these diseases and are greatly preferred over older varieties. Listed below are short descriptions of usually available varieties. Adirondack – Dense, compact head; white flowers and small red berries. Donald Wyman – Rounded Head; small bright red persistent berries. Golden Raindrops – Deeply cut leaves with golden yellow fruit. Harvest Gold – Upright growth habit with persistent yellow fruit. Red Jewel – Upright oval shape; persistent red berries; excellent summer foliage. Sargent – Dwarf, mounted habit; profuse red berries; dark green leaves. Snowdrift – Vigorous, upright-oval grower; red-orange berries. Sugartyme – Upright, spreading; pink buds to white flowers, red berries. Adams – Dense growing, rounded tree; good foliage with red berries. 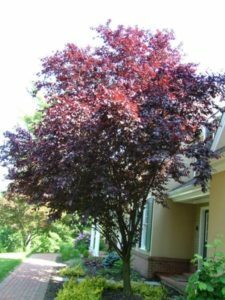 Cardinal – Glossy purple red foliage, pink to red flowers, red berries. Centurion – Upright; red berries for two months. Floribunda – Old favorite; graceful, spreading; abundant yellow-red berries. Indian Magic – Semi-spreading; reddish berries. Jewelberry – Dwarf, rounded head; red berries. Louisa – True weeper; yellow berries. Pink Spires – Narrow upright form; early bloomer. Prairifire – Rounded, heavily branched, reddish leaves when emerging; long lasting burgundy colored berries; highly recommended for this area. Sentinel – Upright, small red berries all winter.